Our marina is one of the best. 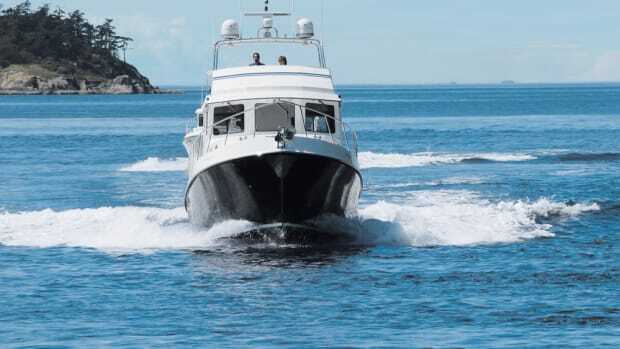 It has wide concrete floats, dock storage boxes, 30-amp power, telephone and cable TV service at every slip, showers and laundries on shore, and excellent security. It is clean, neat, and everything works as it should. The staff is phenomenally attentive. Dock hands are always available to help land a boat, and they will haul away waste engine oil and discarded antifreeze. And there are two excellent restaurants on shore. However. All slips face either east or west. The prevailing wind is from the south, and on the beam for nearly every landing and departure, good reason for an attentive dock staff to come running to take lines. Finally, the fairways between rows of mooring floats are just a bit too narrow, making maneuvering in the wind and tidal current challenging at times. 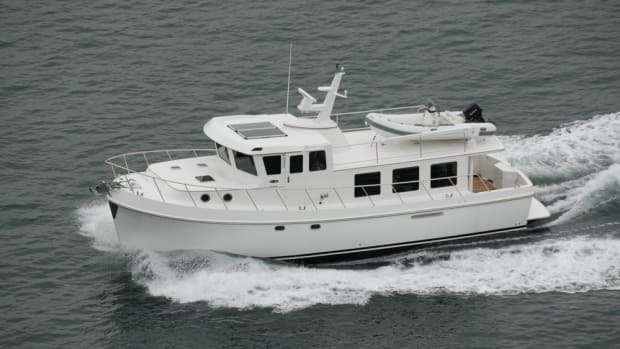 So, an inner sense told me something was amiss when the owners of the 43-foot sailboat that shares a double slip with our 42-foot Grand Banks trawler called on a Sunday afternoon. They are nice people who live aboard, and we talk a lot from boat to boat and while taking coffee breaks. But this was the first telephone call. They had been backing out of their slip in about 15 knots of wind, enroute to a seminar on heavy-weather sailing. The wind caught the bow of their boat and began pushing it back toward the line of boats they had just left. Sailboats are notoriously poor at backing down and no amount of throttle or rudder helped prevent the inevitable collision. While Gary struggled to turn the bow back to the center of the fairway, Anna watched and wisely decided not to risk injury to her hands and feet by trying to fend off. Stricken, she stood near the bow as the sailboat whumped against our moored motor yacht. Their anchor pulpit drifted into the transom handrail on Quadra, ripping out a chunk of teak and shredding a band of canvas in the cockpit enclosure. The force of the impact was transmitted through the heavy bronze stanchions to the caprail, which split down the middle for about six feet. It was a love tap, really, a ding in a car door in a mall parking lot. It certainly was not intentional. The sailors were neither reckless nor feckless, only a tad short on luck. Nor was it unique in our moorage: another Grand Banks on our dock had been rear-ended in similar fashion a few months before. Although only teak and varnish were damaged, the sailors were sincerely distraught. They were embarrassed and remorseful. Two good things have come from this mishap, however. First, it was refreshing to have the sailboat owners call us promptly to report the accident and to offer to pay for all repairs. Their boat was not damaged; because there was no evidence it had been involved in the crash, owners with less integrity might never have called. Apparently there still is reason to believe people will do the right thing. Having had my own close calls because of wind or current in the same marina (and despite the advantage of two engines), I understand what happened. They acknowledged responsibility and I didn&apos;t yell and shout. We remain friends. Second, it gave me an opportunity to deal with those people who call themselves wood butchers, carpenters, shipwrights. (What&apos;s a shipwright? Someone who fixes what&apos;s wrong on a boat.) And to ask a million questions of them. Although most boats today are built of fiberglass, composites, stainless steel and aluminum, people capable of miracles with wood still are busy...very busy. The best are artists, even when the work they do may be out of sight below decks or ultimately covered with paint. Working with hand tools, they cut, shape, and fit wood to machine-tool toleranc es. Using eyes and finger tips as sensors, they create perfection in teak, cedar, fir, and oak- whether the job is replacing a bottom plank, fixing a deck leak, or building a new dining table. And then there are those special people who give that new wood a grand-piano finish, often using home-made tools pulled from battered kit bags, fillers and sealers from personal recipes, and varnishes they swear by. I envy them those skills. John Whitcomb of Seattle Yacht Service came down to assess the damage. Once a bank employee, he has been repairing boats for years. In the beginning, his office and shop were in a truck. Now, he and a partner operate from a major service facility on the waterfront. The damaged section of handrail was relatively short, spanning the distance from the transom gate to the starboard quarter. Some piece of hardware on the sailboat&apos;s pulpit (probably the support for the roller furling mechanism) had ripped away a chunk of solid teak, but the remaining wood had not broken under the impact. Stout bronze stanchions, which support the handrail on our Grand Banks, are screwed into the caprail and the deck. While the bronze stanchions sustained no damage, the impact transmitted enough energy through these stanchions to split the caprail along a line running between the screws holding it to the transom. Roughly two inches by four inches in girth and depth, the caprail fits down over the joint where the deck and hull molds come together. Because a wide channel is ripped in the bottom side of the teak cap to let it fit down over the joint, the caprail is a shell, and not as sturdy as it looks. That&apos;s why it cracked easily. I learned that all of the handrail and stanchions from the center of the boat to the starboard quarter would have to be removed to provide access to this stricken caprail. Except for cutting the new teak pieces, all finishing work would be done at our moorage. Presented with a copy of the estimate, the sailboat owners promptly wrote a check. I told Whitcomb to go to work. The wood joints on Quadra&apos;s trim were so tight at the corner that the muscle of two men was needed to pull the rails free. Because his staff was busy with other projects, Whitcomb asked Bruce Maresh of Seattle Shipwrights to cut and shape the new teak rails. Working with a piece of teak measuring two inches by nine inches by seven feet long-and costing $177.88-Maresh spent a full day on the job. A former Oregon dory fisherman and sailboat racer, Maresh is one of seven independent shipwrights working under the umbrella organization of Seattle Shipwrights, a cooperative on the waterfront in Seattle, Washington. The cooperative leases the building and supplies costly, heavy equipment no single person could afford, including a 16-inch joiner and a 36-inch bandsaw that will cut timber 14 inches thick. Every member of the co-op has at least 20 years of experience. Maresh said he long ago expressed an interest in joining, but other members watched him at work and assessed his temperament and customer relationships for five long years before inviting him to join. Envy struck again as I walked through the huge doorway of the shipwrights&apos; shop. Heavy lengths of oak, teak, and fir, and planks of mahogany and locust leaned against a wall. Major power tools were placed just so, to give the user space to maneuver himself and the wood being cut. Work benches, battered and scarred from years of use, were on the perimeter. On one bench was the teak for the repair of Quadra. The cap and handrails bend laterally to match the curve of the transom, as well as vertically to follow the crown line of the transom. The teak plank chosen for the repair had a grain pattern that would enhance the sense of curve, even though it would be cut from a straight board. Maresh used the old pieces as a pattern and laid out the lines for the new. To my amazement, after his first cut, the rough rail appeared to have been bent...not sawed. He used a router to cut the radius on each side-the curved sides, in other words. He switched on a table saw to cut the wide, deep bottom notch on the caprail, one kerf at a time. The starboard corners of each rail were then cut for a mortise-and-tenon joint with the side rails. After fitting the bronze transom gate hinge on the handrail, Maresh ran his fingers along the wood, and sensed a rough edge where it joined the metal. Using a small plane, he peeled nearly invisible shavings from the teak and then ran his fingers along the wood-metal joint again. Sandpaper was next, and, after another test by touch, he was satisfied. Maresh cut the rails one eighth of an inch "proud." The extra length would give the installer a little extra material for a perfect fit. It was as easy as a lifetime of experience could make it. One problem with this repair job was that it was a small one. 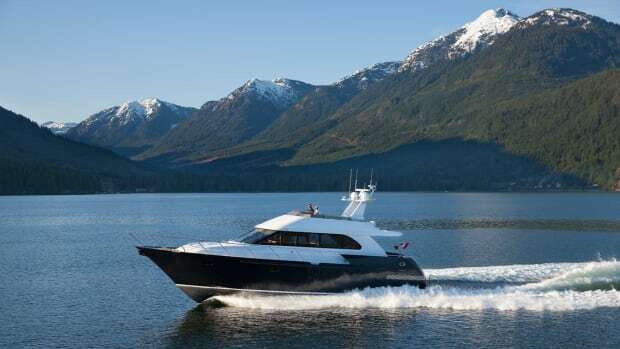 It was hard for Seattle Yacht Service to pull workers off major projects during its peak season for the 30-minute effort to remove the damaged parts and for reassembly, which took several hours. Finally, though, the new rails were complete and Whitcomb stole some time and came to the boat to begin putting it back together. After trimming some of the "proud" material for a perfect fit, he screwed the caprail down, glued plugs in the screw holes, and assembled the handrail. The screw holes were a particular challenge: with only about an inch of wood depth to work with, he had to countersink the screws enough to allow a good plug to be driven home, but without going so deep that only a thin shell of wood remained to hold the screws. That accomplished, Whitcomb turned the job over to his one-man finishing crew-Tom Ring. Tom sanded, sealed, and varnished the new teak. 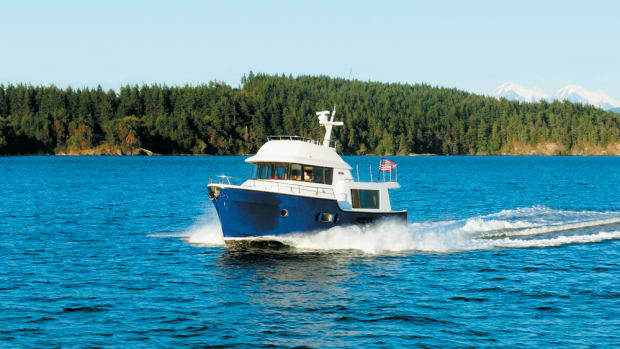 Again the scheduling problem: It was hard to take time away from varnish jobs, needing days and weeks of dedication, to spend an hour or so aboard Quadra, which was about a 15- minute drive from the yard. Things got worse. It began to rain. Not a lot, but enough moisture day after day to prohibit sealing and varnishing new teak exposed to the weather. So, what&apos;s new about that in Seattle? When first installed, the raw teak was much darker than the 21-year-old teak surrounding it. During the four or five days of waiting for dry weather, however, the new wood bleached significantly. By the time Ring arrived there was little difference in color. One disappointment: the grain pattern in the new wood doesn&apos;t match the old. The new has broad patterns, with some dark streaks, while the grain on the original wood is tight and fine and has a uniform golden glow. Standing alone, the new wood is beautiful. Butted against the old, it has a slightly disconcerting mix-and-match appearance. However, there isn&apos;t a raw piece of teak in the world that would match the fine stuff GB used on this boat many years ago. "It just isn&apos;t possible to match," Whitcomb told me. "It just isn&apos;t there." While Grand Banks and other builders continue to install fine teak in new boats today, good wood is increasingly hard to find as tropical forests are logged. Some builders are switching to cherry, ash, and maple for interior woodwork because of the high cost and limited global supply of teak. When exterior wood is specified, however, it continues to be teak, because of its high oil content which makes it impervious to rot and the ravages of weather. Whitcomb and Ring predicted the new wood would bleach to a lighter shade after exposure to weather. Being a chronically frustrated brightwork finisher-the stuff I lay down never looks quite right, nor does it hold up as long as it should- I watched Tom Ring carefully, and unashamedly asked question after question. He did a finish sanding, using a homemade sanding block and strips of the sticky sandpaper that comes in rolls. Next, he brushed on five coats of Pettit clear sealer, which isn&apos;t at all clear. The sealer looks dark brown in the can and leaves a golden glow as it soaks into the raw teak. But it went down easily and dries quickly. Ring used a cheap, throw-away bristle brush to apply the sealer. A veteran of more than 20 years in the business, he doesn&apos;t like or use foam brushes. Most of the sealer was sanded away on a later visit, leaving the grain filled, and the wood ready for varnish. And that consisted of four coats of Epifanes gloss varnish, applied with a badger-hair brush, with the new surface sanded with 600 grit paper before the final coat. It took some time to get it all done, while dodging rain drops and the owners&apos; need to use their boat, but the work is now finished. The combination of sealer, sanding, and varnish makes a good system, Ring says. "It will look good five to ten years down the road," he promises. It was an unfortunate accident, yes, but a good project. The integrity of the sailboat owners reinforced the principles of honesty and being a good neighbor. The couple sets a fine example for others to follow. There were personal benefits, too. I learned more about how our old boat was put together, a little more about woodworking and woods, and soaked-up trade secrets by watching an old pro working with brush and varnish. Perhaps my next brightwork project will turn out better. And should I ever blow a landing and bang a neighboring boat, I&apos;ll remember the good example set by Gary and Anna.